The problem with modern wireless routers that they’re built for end-users, who have minimal or no technical experience and knowledge. For advanced users and geeks like us, we like to tweak things, use one device to its maximum capacity. OpenWRT, DDWRT and LEDE are firmwares for that reason. OpenWRT (and DDWRT, but from now on, I’ll just say OpenWRT) is a Linux distribution, aimed to embed devices, especially the routers or network devices. By installing OpenWRT, you unlock the whole world of possibility: better performance, better signal power, more advanced features (such as VPN server/client; QOS; BitTorrent client; web server; Mingle server; etc. ), guest network, monitoring / logging. It’s not so surprise for the runner up for the position of Best OpenWRT Router: Linksys WRT AC1200. Even though Linksys WRT AC1200 is not as powerful as the AC3200, but it’s enough for most users. The Linksys WRT AC1200 comes with a typical Linksys routers’ appearance: black and blue box, so there’s not much to talk about. Although the WRT AC1200 doesn’t have whistles and bells like the WRT AC3200, but it’s definitely a good router. The most regconizable feature of the Linksys WRT AC1200 is that it comes with 2 detachable antennas. 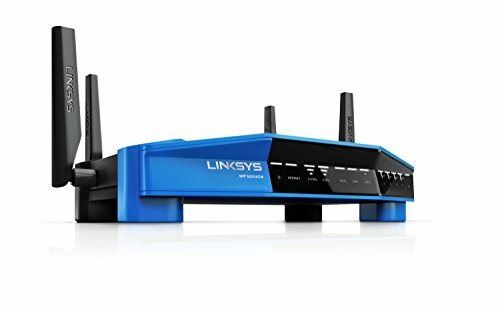 The Linksys WRT AC1200 packs with a dual core CPU clocked at 1.3 Ghz, and it’s plenty powerful compare to most routers on the market. Like many other Linksys routers, this router comes with 512 MB RAM and 128 MB flash. Again, I’ve never utilize completely 512 MB RAM at any given time, so that’s a lot to use. For advanced users, 128 MB flash won’t be enough, but remember, you can always use external storage with the two USB ports at the back of this router. The Linksys WRT AC1200 can operate at dual band mode 2.4 Ghz and 5 Ghz to provide the best performance, cause in this day and time, the space is jam with wifi signals. Just like the Linksys WRT AC3200, the AC1200 shares many features such as Web setup wizards, Parental Controls, Dynamic DNS, Content Filtering. Linksys WRT AC3200 is one of the routers that has the highest compatibility with OpenWRT firmware at the moment. Installing the OpenWRT firmware is as easy as pie: download firmware from OpenWRT website, install via web interface, wait, and profit. Due to no official support from the OpenWRT or LEDE project and enthusiastic supporters are still struggle to make OpenWRT compartible for Linksys WRT AC3200. Until there is stable firmware, official or unofficial, we will remove Linksys WRT AC3200 from the list of best routers for OpenWRT / LEDE. It’s no doubt that the title of Best OpenWRT Router would belonged to a Linksys router, and above of all, the Linksys WRT AC3200 stands out the most. The very first brick of the OpenWRT Project was placed by Linksys, when they built firmwares for their routers based on opensource softwares. Since then, Linksys’s routers have the best compatibility to the OpenWRT firmwares. Let’s take a look at the appearance, Linksys WRT AC3200 goes with the classic router’s look: a horizontal box with antennas. Some people may prefer routers with attractive looks, but not me. I want to hide my router somewhere no-one can ever find it, I want my router to operate in the back for days without any problem. Linksys WRT AC3200 is absolutely the beast for all my needs. My house is about 1300 square feet, I placed the Linksys WRT AC3200 in my electrical closet on the first floor. And to my surprise, the Linksys WRT AC3200 can cover the house with Wifi signal without any problems. The heart of Linksys WRT AC3200 is a dual core CPU clocked at 1.8GHz with 512MB DDR3 RAM and 256MB flash. Now, that’s a beast for a router, and remember, you can always plug external storage to this router. With the powerful CPU and plenty of RAM, the Linksys WRT AC3200 is able to handle dual band of frequencies: 2.4Ghz and 5Ghz. This is one important feature because our space is getting more and more kind of radio signal that might interrupt our wifi. Furthermore, with a geek like me, 512MB RAM is more than enough to run several programs on this router with the OpenWRT. And honestly I’ve never used more than half of the RAM at any given time. 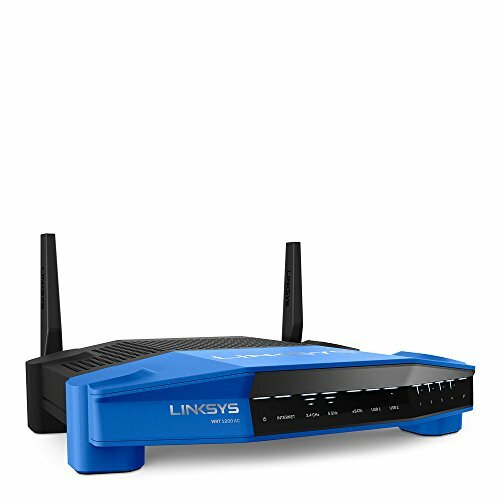 Linksys WRT AC3200 is equipped with the Tri-Stream 160 Boost Bandwidth technology, with the ideal condition, Linksys WRT AC3200 can transfer up to 2.6Gbps wirelessly. Another great feature of Linksys WRT AC3200 is the MU-MIMO (or Multiple Users – Multiple Inputs Multiple Outputs), allowing to transfer data to multiple devices at the same time, at the maximum speed. It’s known that typical American citizen own 4 devices that have the ability to connect to Internet. My family have 6 members, and we have 40 Internet devices at our home, and Linksys WRT AC3200 haven’t let us down a single time. Now, let’s talk about connectivity. The router has one Gigabit WAN port to connecting to your modem, and 4 Gigabit LAN ports to your local network. Linksys WRT AC3200 also comes with a USB 3.0 Type A port, you can plug external storage or a printer; and a USB/e-SATA for your external storage. We also have a Reset button, a 12 V DC port and a On/Off Switch on the back. There are nothing except antennas on the side, and only light indicators on the front. If you use the original firmware, you’ll be able to access plenty of end-user features: Web setup wizards, Parental Controls, Dynamic DNS, Content Filtering, etc. Linksys even went the extra miles to create a Smart-Wifi app to allow you control and monitors your network from anywhere in the world (as long as you and your router have Internet connection). Although there’s no official firmware for the Linksys WRT AC3200 at the moment, because the router is fairly new (first available at September 10th, 2016), but the router will be officially supported in few months time. At the moment, we can use unofficial firmwares (firmwares that are built from stable and developement branches, and are maintained by third parties). To the time of writing this article, I find that the Mildly Customized Chaos Calmer [CC] Build by kaloz is the most stable firmware. 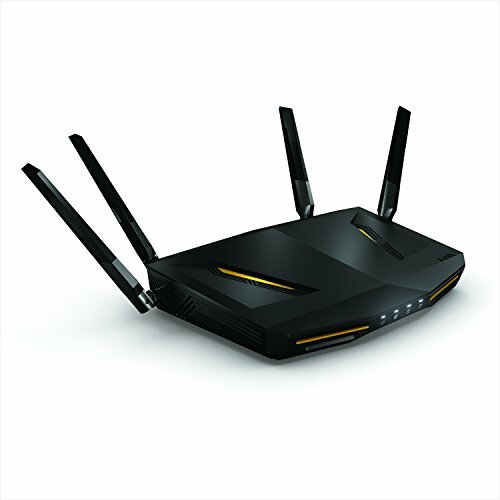 ZyXEL Armor Z2 AC2600 is the kind of router that will catch your eyes on the first time: it has a metal look design and appearance gets the ideas from cars and robots. ZyXEL Armor Z2 AC2600 comes with a powerful CPU clocked at 1.7 Ghz dual core and 512 MB of RAM. One powerful horse for a wireless router. Four non-detachable antennas on the sides and back. You will find 4 Gigabit Ethernet ports and 1 Gigabit WAN port on the back of this router. ZyXEL Armor Z2 AC2600 features MU-MIMO for maximum performance and Beamforming technology to focus its signal. ZyXEL Armor Z2 AC2600 has one of the best Web UI that I’ve ever seen. The most useful feature on the ZyXEL Armor Z2 AC2600 is the ability to monitor bandwidth on each device. The Setup Wizard is very intuitive, and it took me just few minutes to get the router ready to use. ZyXEL Armor Z2 AC2600 is supported by the latest LEDE firmware. If you’re not familiar with LEDE, this firmware is based on OpenWRT as the OpenWRT project is having some internal problems. All the tests we performed in this article is for reference, as they’re not scientific, not performed by experts in this field. Please read those numbers with a grain of salt. Then we proceed to copy a large files between router and a laptop and measure the average speed. 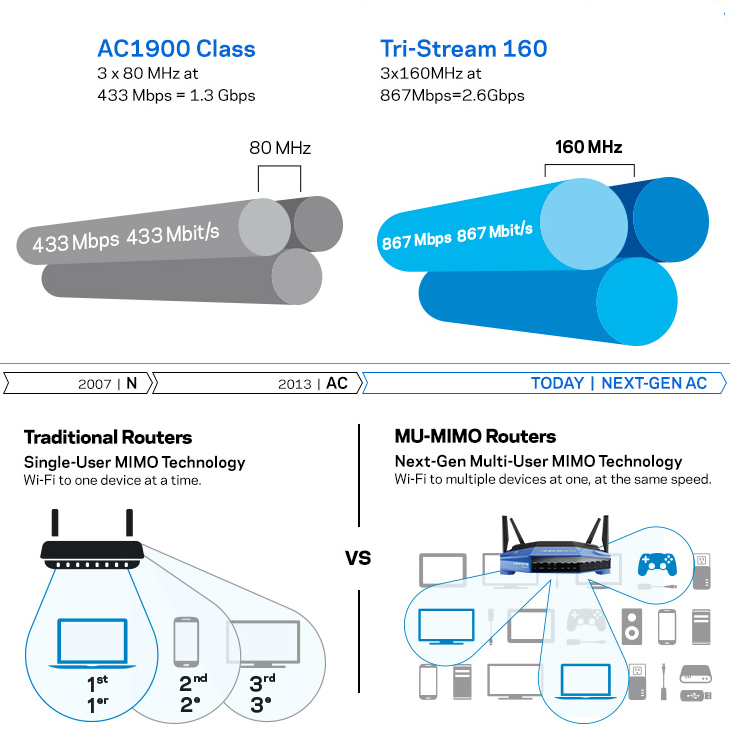 We’re expecting to update this article monthly, and all the routers in this article are quite new as they were manufactured in 2019, so I don’t think there will much changes in 2020. It’s no doubt that the Linksys WRT AC3200 is the best OpenWRT Wireless Router with many advanced technologies and the powerful and stable signal. But the 2 other contenders are very good, too. Buying which routers depends on your budget and personal reference. If you think we miss any good candidate for the position of Best OpenWRT Routers, please kindly let us know. Please take Turris Omnia (https://omnia.turris.cz/en/) routers into the comparsion, too. Thank you for the suggestion, I’m ordering one, it will arrive in few days, and I’ll review the router. But honestly, it looks amazing. The WRT AC3200 doesn’t really work with OpenWrt/LEDE. You might want to update your recommendation to point out that although on paper it is the “best”, in reality it is almost unusable. The wifi driver is terrible and folks have been working on a fix for months (https://github.com/kaloz/mwlwifi/issues/118). It was release as “open source ready” but people, including myself are having serious issues with the 5ghz wifi dropping and being unusable until you power cycle it. That’s correct. Thank you for pointing that out, we’ll update the article. After using so called “high-end” routers from main stream vendors like Linksys for years with more or less dissatisfaction I switched to Turris Omnia about one year ago. It’s the first time that I am truly satisfyied. The hardware specs are great, the router is highly customizable and the Turris team does a great job in improving the OS – based upon OpenWRT. E.g. I replaced the two pre-installed mPCIe wifi modules with more powerful once and installed an internal mSATA SSD. Not only the software, but the hardware too, is fully open source. So, I recommend to include the Turris Omnia in your review. Thank you for the suggestion. I’ve had some suggestions to test the Turris Omnia, but it’s quite hard to get one here in the US. I’ve been trying to order it on Amazon but somehow my orders got rejected. I’ll update the article when I have my hands on one. I have had the opportunity to compare the Marvell Armada 385 (mvebu) based WRT1200AC to a Qualcomm Atheros IPQ8064 (ipq806x) based TP-Link Archer C2600 with MU-MIMO. Both of them run LEDE 17.01.2, I don’t have MU-MIMO capable clients yet. The Archer C2600 yielded much better results in terms of range, transfer speed and device compatibility. It has even 30% lower power consumption. I think IPQ8064 is simply a more advanced platform. I would recommend staying away from the Turris Omnia at least in the USA. I bought one as part of the original campaign. Sadly it hasn’t worked and the support is HORRIBLE. I had high hopes but for the money, the unit isn’t worth the frustration. That’s sad to hear. I had high expectation for Turris Omnia, mostly because of many people in Europe recommended it. It’s so hard to buy one in the US. Isn’t this one more like a computer than a router? I know that this article is more than 1 year old. But I’d just like to say that the WRT3200ACM is still a beast of a router for OpenWRT. I’m using the 18.06.0-rc1 version and it’s been great ever since I got it about a month ago! The price of the Linksys WRT AC1200 listed above, $74.99, shown as update as of today, Nov 30, 2018, is notably *less* than any of the prices found at the associated Amazon link. PS: Thank you for this article!